"Blood magic is rooted in emotion," he said. "Pain, pleasure, fear, passion--anything that heightens your emotion can be used to increase the strength of your spell. But therein also lies the trouble. It's easy to let the magic overtake you. It's like a dam on a river. If you aren't careful, you can bring the whole dam down on top of yourself." Princess Aurelia senses that she is a witch, possessed of forbidden blood magic. But she is a royal witch in the witch-hunting kingdom of Renalt, with a power-grabbing Tribunal that would destroy her and her family if they knew of her power. Warned by the wraithlike spirit of the Harbinger, Aurelia sees that her only chance of escape will be her upcoming wedding with the prince of the kingdom of Achlev. Concealing a wedding dress made by her mother the Queen and taking her little brother Conrad, Crown Prince of Renalt, Aurelia flees her kingdom, for protection switching identities with her maid Emilie, helped by her dearest friend Kellen and an enchanted Empyrean horse, Falada. But her wedding is to be with a reclusive and reputedly frail prince, and Aurelia finds Achlev no refuge. Its protective wall, held up by enchanted gates, has been breached by evil magic which has destroyed the spell of two of its three guardian gates. The decaying kingdom itself is roiled with hate, greed, and murderous plots, led by her betrothed's father King Domhnall, who is "managed" by the evil Toris de Lena, and in Achlev, not everyone is what they seem. But Aurelia, as Emilie, finds love and help in the person of a young man who calls himself Zan. And when Zan, protecting her, is stabbed and near death, it may be only Aurelia's blood magic that can save them all and reveal their true identities to each other. 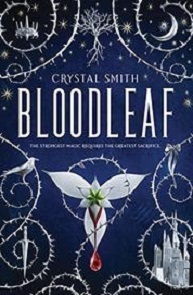 Crystal Smith's forthcoming Bloodleaf (The Bloodleaf Trilogy) (Houghton Mifflin Harcourt, 2019) is a fantastical, frightening, gory, romantic,young adult novel filled with both appalling and lovely imagery, set in a dystopic, vaguely medieval world of two rival but interrelated kingdoms. This novel is for readers who like their images vivid and their plots convoluted, with the qualities of both A Game of Thrones and The Hunger Games, the grimmest of the Grimm Brothers tales, and the inbred internecine warfare of classic mythology. This first of a planned trilogy is not for the faint of heart or the hyper-sensitive psyche, but for young adult readers it is a rousing and romance-tinged page-turning fantasy adventure.